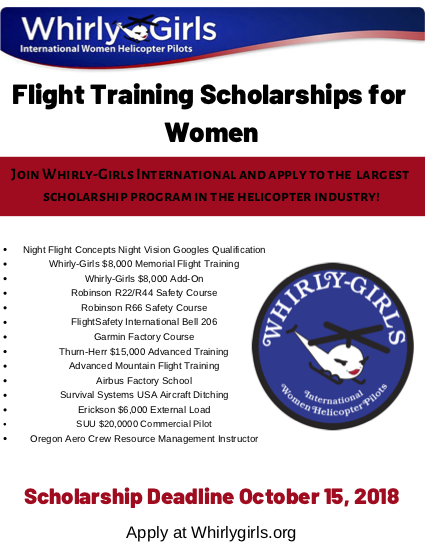 Whirly-Girls scholarship season is open, and it’s the largest helicopter scholarship program in the industry. There are a lot of exciting scholarships available, including new instrument/commercial training scholarships from Southern Utah University (SUU). You can read the press release announcing scholarship season and find out more by visiting our Scholarship Offerings and Requirements page. Remember: the deadline is October 15, and you need three letters of recommendation for your application. Do you have questions about the Whirly-Girls scholarship program or how to apply? Contact Vice President of Scholarships Alison Martin at scholarships@whirlygirls.org.